It is that time of year that the clocks go backwards. This give you the opportunity to stay in bed for an extra hour enjoy the relaxation and emerge feeling refreshed. We however were camping in Yorkshire in a storm at the end of October, we were treated to an extra hour of being cold and miserable lying awake listening to the wind and rain lashing against the tents. We emerged from tents, packed away and headed to Ingleton to meet up with those who had gone home to the comfort of warm beds. We again split up after the tea drinking, a Swistow through trip for the dangly folks and a trip into Notts II for those of the wandering about persuasion. 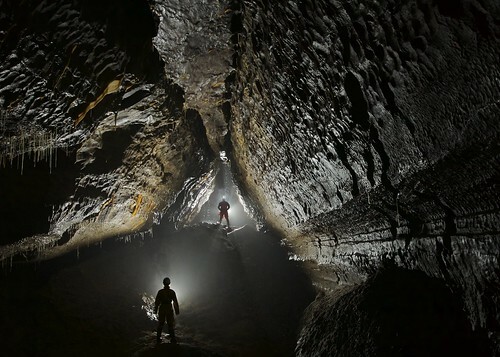 We parked, changed and headed down the very impressive 200ft dug shaft to go for our explore of Notts II. We first headed downstream to the sump before heading upstream and spent a good while taking photos in the main stream and Curry Inlet. With people getting very cold stood around taking photos we headed out stopping off to take photos of the very impressive column in the top of the keyhole passage. This required tip toeing on muddy ledges high up and was completed by Mark and Jess, before we headed out. On the way out Mark led the way up the climb followed by Mike, Lucy, Jess and then Brendan. Half way up the scaffolded shaft I was surprised to see a light below me, I shouted down assuming there must be another group in the cave, and was surprised when Lucy called up saying she had got lost in the dug shaft and both Jess and myself had passed her unknown. Buoyed from the activities in Jingling and Aquamole Pots the three of us decided to attempt the classic Swinsto Pull through trip to complete a full weekend of caving in the majesty of the Yorkshire Dales. 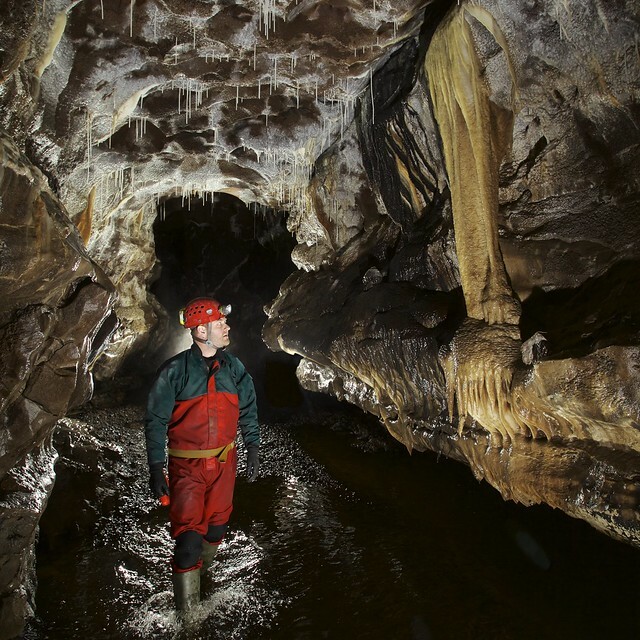 This is a committing trip which involves going into the Kingsdale Master Cave and rigging a short pitch from the stream bed which would be required to get out of the system later and then heading onto the top of the hill and following the stream through the system to the bottom. 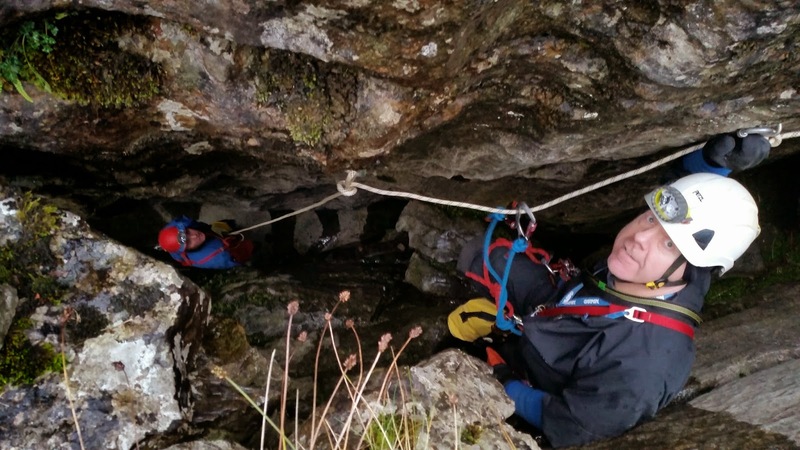 Unlike most SRT trips though the intent is for the entire group to ascend each pitch and then pull the ropes down behind us thus removing any possibility of escape back up to the top but also removing the need to retrace our steps and de-rig the cave. We discussed the plans over breakfast in Ingleton and came up with a simple plan: we all head into Valley Entrance and make sure that the exit was clear before heading up to the top; then Tony and Rob would alternate rigging each pitch and I would follow at the rear de-rigging and setting the pull-throughs to recover the ropes. 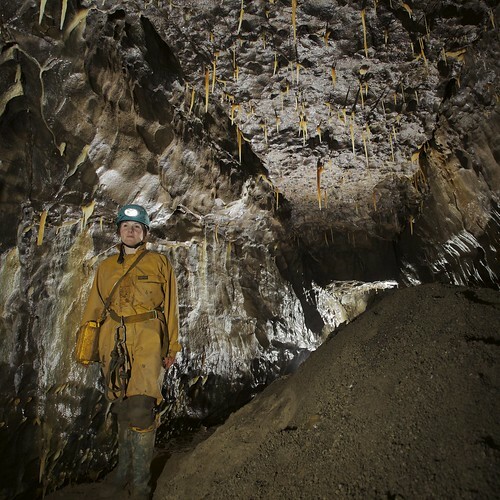 We went into the master cave and headed to the pitch head but along the way we followed the newly dug passage for nearly 200m in error so had to back track which added an extra bit onto our anticipated time. Tony rigged the rope and Rob and I descended an in-situ rope whilst he was rigging and headed to the exit from Swinsto Main Aven to make sure there was enough airspace above the water to enable us to get out at the bottom. We moved back out of the cave noting that it would take us 20 min to exit the system from the pitch head on our way back. We got to the entrance and I called in our call-out details and then Rob lead us into the system and we were off. The plan was simple one rope carrier would rig the pitch and the next rope carrier would be second down and head straight off to rig the next pitch whilst I de-rigged and pulled through and helped load the rope bag so that when we arrived at the next pitch it would be rigged and we would carry on alternating between Tony and Rob rigging and then route finding (downhill and follow the water) to the next pitch. Most of the pitches had a lot of water cascading down them and the background noise from all the water was a continuous thunderous roar that reminded us were playing in an system sculpted by the power of that water. There are 9 pitches down from the top so including the exit pitch they each rigged 5 pitches by themselves. This was an outstanding effort on their parts and they proved to be vital assets on a trip like this. We all walked out from the Valley Entrance with big grins having completed a Yorkshire classic. 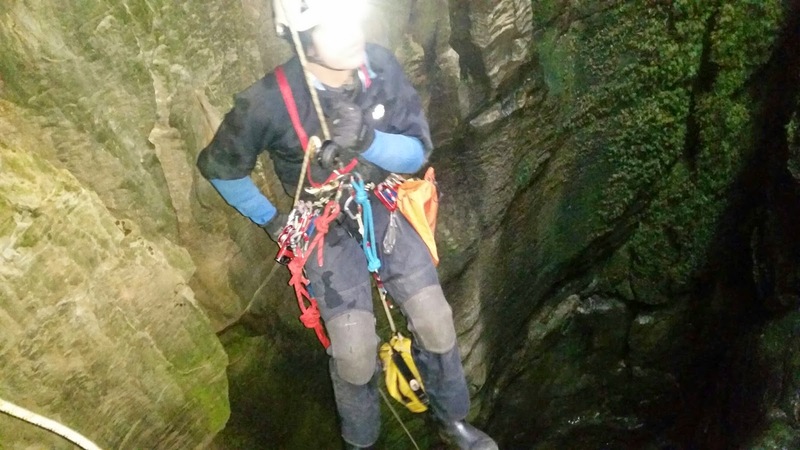 It is worth noting that both Tony and Rob only began caving in March 2014 and they only started having a go at SRT in May, but through practising on the mill and getting involved in club trips they are now in a position where they are looking at doing some self-guided SRT trips in the future as full members of DCC. 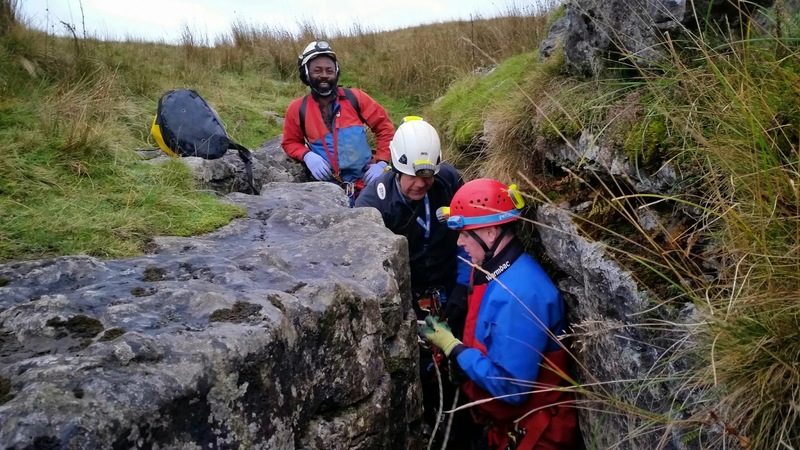 Having only started caving myself in January 2014 but with a background in climbing and mountaineering DCC has provided us with the support to develop us all to become competent cavers in our own right. 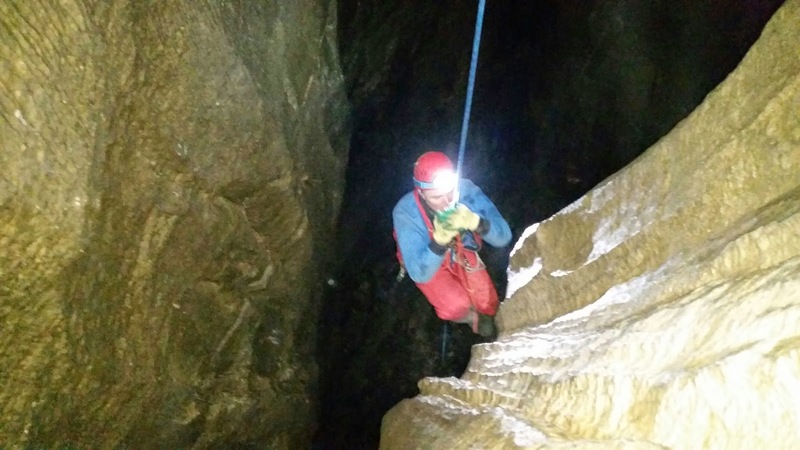 I have to mention this so other cavers reading this realise that we all felt safe and operating within our abilities during this trip, despite our relative novice status. 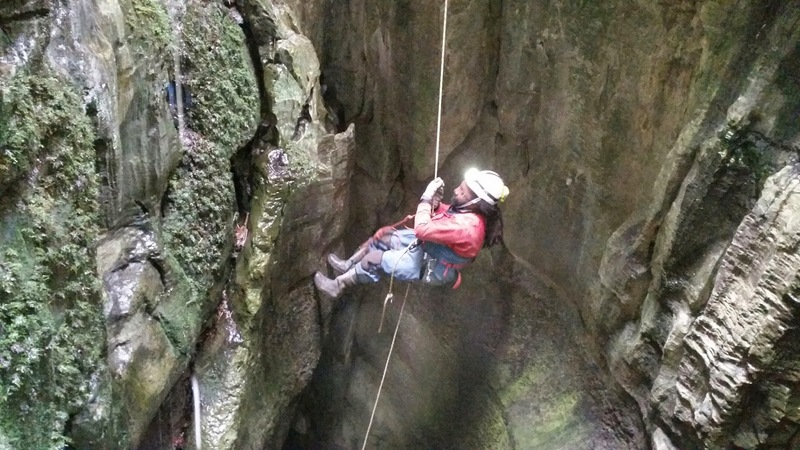 But more importantly if any new cavers or people considering having a go at caving are reading this then get to a good club like DCC and get involved. SRT opens up a whole new range of systems that may only be accessed via ropes. Ten of Dudley Caving Club's finest met up at 8:30 in Inglesport to start the weekend as any should, with breakfasts washed down with copious amounts of tea. After a quick fondle of gear and shiny metal bits we split into two groups, those going for a little dangle and those going for a little wander. Being in the wanderers team we headed off to Kingsdale, parked and changed for the walk to Illusion Pot. This cave was billed as being easy to find and easy to navigate, so without any preparation we set off in pursuit of what we had heard was a mighty fine cave. Our lack of preparation showed and we walked a couple of hundred metres more than what we needed to on the approach, but were soon headed down the concrete rings that formed the first part of the entrance. Some easy caving followed that took us to the duck, which Mark duly investigated, although he promised we could get through we were having non of it and spent the next 30 minutes bailing like mad. 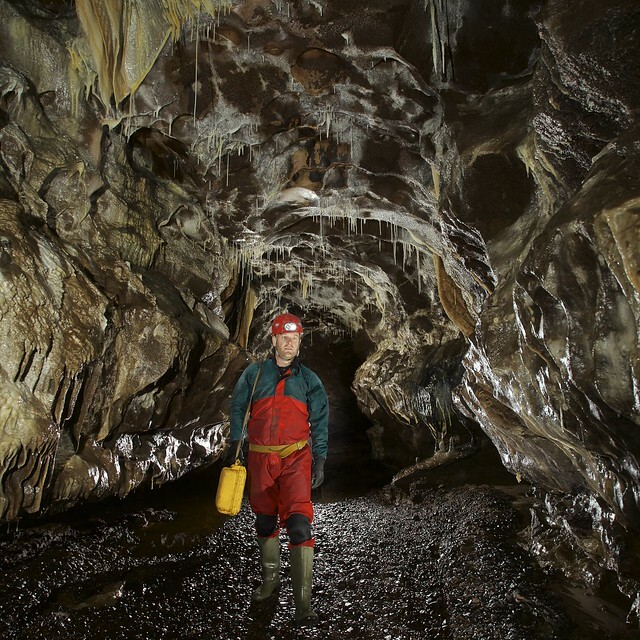 With the water dropped six inches we could make our way through comfortably and were soon through into the main cave. 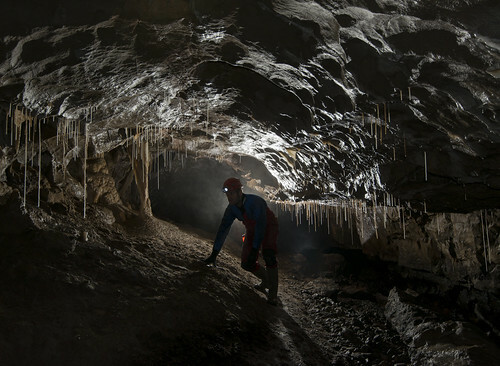 We spent some time in the cave exploring all routes that we could find, ending in a finely decorated passage in one direction and in the other arriving at a traverse and climb down to the sump (as recommended by Helen - many thanks for that little treat!) After about four hours in the cave we were getting a little chilled and so we made our exit in time for cake and tea in the cafe. Those staying in Yorkshire spent the evening in the New Inn at Clapham. 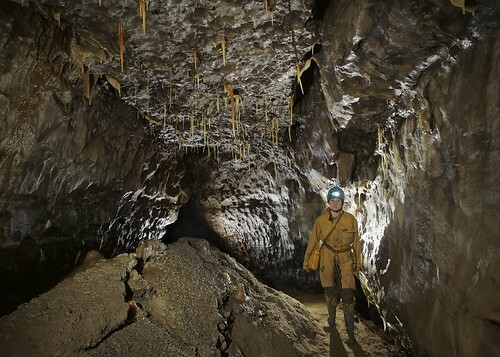 A fine cave requiring no tackle apart for some protection on the traverse that leads directly to the sump. After the excitement and tears of the day before, we had quite some trepidation about today’s cave as we were to attempt something rather different. Cova Des Coloms is a sea cave which can only be accessed by 35m abseil from above or a 200m swim from the nearest beach. To make it even more challenging, to get into the cave itself there is a short tunnel to go through which sumps with each wave! We discussed at length whether to even attempt it, and finally decided to go for it, but to give ourselves every opportunity of success. With this in mind we stopped at a shop and bought a shark, a pink aeroplane and 2 baby seats – all inflatable of course! Parking up in the designated spot we kitted up in bikinis and wet suits (the boys looked great) and carrying our kit bags and inflatables we set off to find the coast path. Trekking across a small beach we found we were well overdressed as it was obviously the local nudist beach, but undeterred we made our way around the coast and eventually found the spits above the cave mouth. Phil and Helen had decided to swim in from the nearest beach so they set off while Mark rigged the rope for the abseil in, with Chloe wanting to be first into the sea. We had decided to minimise kit, as we would be swimming back to the beach afterwards, so only had harnesses and a krab each apart from Brendan who wanted to prussic back out. 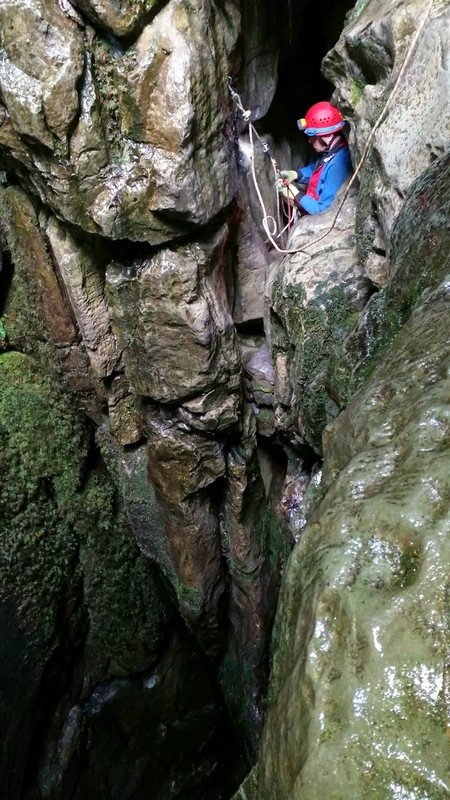 It was quite daunting abseiling 35m on an Italian Hitch! Apart from the obvious DON’T LET GO OF THE ROPE! we found that from half way down we were spinning round madly to the point I felt quite sick, and it was a relief to get into the water. As Loz was descending there was a shout from the water of SHARK! SHARK! as round the corner swam Helen with her inflatable, accompanied by Phil. 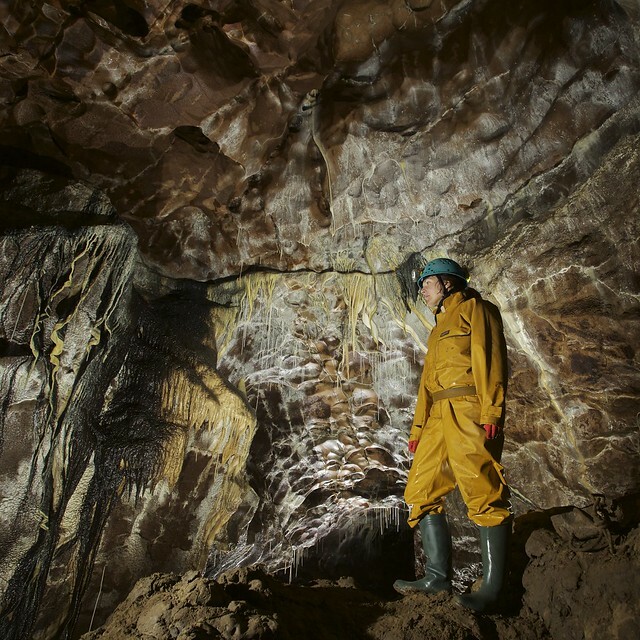 Soon we were all at the mouth of the cave, looking with trepidation at the short sump. However, for anyone who has been in Stoke Lane Slocker (Mendips) in high water, this sump was a piece of cake and we were soon all through and ditching our harnesses inside the cave. Considering how close we came to not attempting this cave, we were all absolutely blown away by what we found inside. Not a huge cave, but with several crystal clear lakes to swim through to access each chamber, and the amazing formations we had now come to expect. Helen and I snorkelled around exploring the Atlantis-type underwater world while Loz performed aquabatics (see what I did there?) for the cameras. Finally it was time to go, and most of us started the long swim back to the beach while Brendan prussicked back up. Five minutes later, a boat pulled up at the mouth of the cave with a party of paying tourists in it – apparently it costs £50 to do it that way! Looks like we got out just in time. Today’s cave was going to be quite a tough one – over an hour’s steep ascent with a fair bit of kit to carry, and a decent amount of caving to be done once we got there. It was also described as ‘a small entrance hidden by bushes, extremely difficult to find’. On a daily basis I had been translating the Mallorcan Caves book from Spanish into English so that we could follow the directions to each cave and the descriptions once inside. This particular set of directions was particularly hard to translate with lots of words I’d never seen before, so I had to guess the meanings – hopefully I’d get it right? Step 1 - We found the suggested place to leave the cars, but were immediately confronted by the local farmer who was pissed off with cavers leaving their cars there. He agreed to let us stay there if we promised to pass on the message to others to park elsewhere. Step 2 – a house had been built across the path we needed to follow! We decided to skirt around the fencing to see if we could pick up the path. My translation read “look for the dry water channel” and indeed, there was a gully running behind the house that obviously would run with water in the rainy season. Step 3 – my translation read “go up the (gully) until you pass two “…”, go under them.” This also made sense when we came across two kind of strainer gates across the gully, which were hinged so we could climb underneath. At the end of the gully we came to the mountain proper, and set off to struggle uphill. All went well for the next half hour as we followed the book’s directions, which coincided with the GPS signal. As we made our way higher, however, we girls kept following the directions in the book (according to my dodgy translation), whereas Mark and Brendan set off over the top of the hill with their GPS and Wal decided to follow his nose. Our group ended up going too low into the gully and needed to climb back up to pass a vertical wall. Setting off up a climb which was easy going at the bottom, I found that the holds got sparser and the wall got more vertical as I got higher, turning into something that I would hesitate to do on a rope, let alone soloing with a big kitbag! Hoping that Chloe was following OK, but unable to stop, I finally reached a ledge where I could rest. I looked down to find that Chloe was nowhere in sight. For the next 45 minutes I was completely alone in the mountains. Calling the girls and panicking that someone may have got hurt I climbed up and down and around until rounding a corner I came upon some cairns which I figured must be on the route. Even better, the girls finally answered my shouts, but from what seemed miles away in the bottom of the valley. Telling them to keep coming upwards, I set off to find the guys, and success! I could see Wal on the edge of the next cliff. Unfortunately the girls were now out of earshot again, so Wal called Mark to come and help, and eventually we were all reunited, if rather shell shocked from our near-death experiences. Mark told us that even with the GPS coordinates he had spent at least half an hour locating the cave mouth as it was so well hidden. I had been really looking forward to this cave, Cova de Cornavaques, and I wasn’t disappointed. Really unusual formations and shapes and colours in the walls and the roof, and incredibly long thin roots which were hanging into the cave and had calcified made this cave one of the best yet! After a fabulous time in the cave it was time to set off back to the cars. Helen obviously hadn’t had enough excitement on the way up and slid over an edge – we just saw her backpack disappearing! Luckily she wasn’t hurt and we made our way safely back down just as the light went completely. 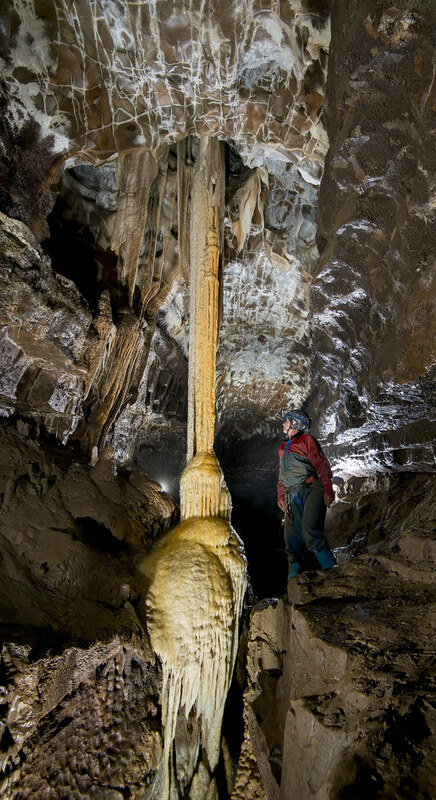 A bit of an epic day, but surely no caving week would be complete without one?